Justice Adrian Saunders, a native of St. Vincent and the Grendadines, will become the next president of the Caribbean Court of Justice (CCJ). He led the development of the court’s first strategic plan in 2012 and currently chairs the ongoing project to develop and execute the strategic plan for 2018-2023. Justice Saunders has participated in the court’s public outreach country missions, and has held successful interactions with private and public-sector groups, labour unions, school children and other stakeholders throughout the region. PORT OF SPAIN, Trinidad – The Honourable Justice Adrian Dudley Saunders, a citizen of St. Vincent and the Grenadines, has been appointed as the incoming president of the Caribbean Court of Justice, with effect July 4. The Heads of Government of CARICOM made the appointment at its last meeting, held in Haiti Feb. 26-27, acting on the nomination of the Regional Judicial and Legal Services Commisison (RJLSC). The RJLSC had selected Justice Saunders after a competitive merit-based process. Justice Saunders is chairman of the Caribbean Association of Judicial Officers (CAJO). He is also the course director of the Halifax-based Commonwealth Judicial Education Institute. Saunders co-authored the book, Fundamentals of Caribbean Constitutional Law. 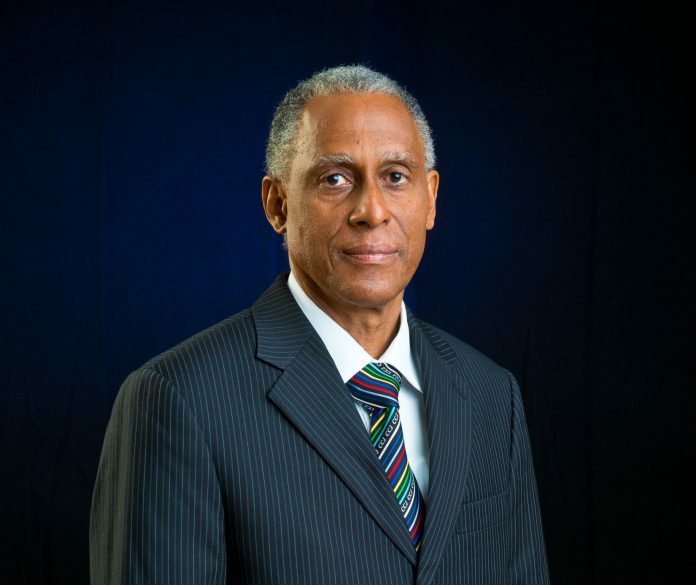 He holds a bachelor of laws degree, earned at the University of the West Indies (Cave Hill) in 1975, and the Legal Education Certificate of the Hugh Wooding Law School in Trinidad and Tobago in 1977. He was called to the bar of St. Vincent and the Grenadines in that same year. Saunders remained in private practice as a barrister and solicitor from 1977 until 1996, when he was appointed as a judge of the Eastern Caribbean Supreme Court (ECSC). In 2003, he was confirmed as a justice of appeal of the ECSC and one year later he was appointed to act as chief justice of that court. Saunders was appointed a judge of the CCJ in 2005.